I suffer from an apparently incurable condition called lineupitis. It runs strong in my family tree and is likely very much the reason why we were never taken to Disneyland as children. Don't worry, I'm not bitter. We got a trampoline instead. And then another year we got a hot tub instead. Basically there are number of very fun things my parents did for us and outfitted our home with instead of taking us to Disneyland and I am ok with that. However, this condition basically makes it impossible for me to wait in line for any great lengths of time without developing hives or at least a very serious case of the heebee-jeebies. Funny how spell-check doesn't think that's a word. Because if you saw me in a lineup that had me waiting for more than 10 minutes, you'd know exactly what I was talking about. So, here's the problem. We're supposed to be popping south to visit some new, sure to be dear-life-long friends today. 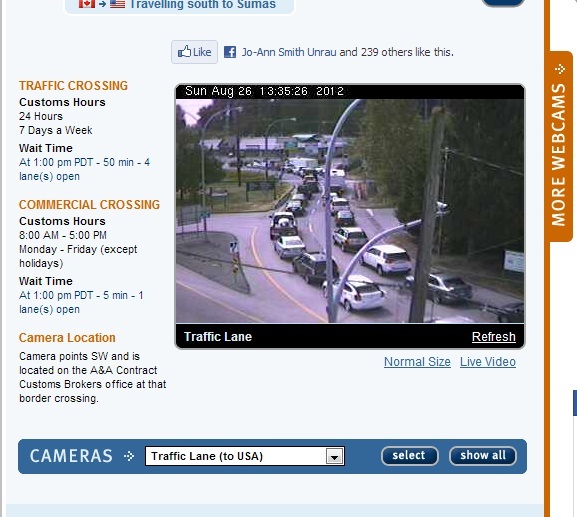 This is what the border lineup looks like right now. It says it's a 50 minute wait. Which means for reals it's at least and hour and 15 minutes. Considering my condition, it might kill me. I'm hoping it's going to magically disappear in an hour when I "have to-have to" leave. Forget a leisurely stroll through Costco before we land on their doorstep. I'll be grabbing milk and cheese like I need to put out a housefire at this rate. I'm fairly certain of this. If the lineup doesn't dwindle, I'll have to bring snacks, and water, and probably a barf bag. Where is my medical kit? I think I might be hyperventilating while just thinking about it. Betcha didn't know one could do that and type at the same time, eh? Sometimes I can't help but speak Canadian. I have a heritage to protect, eh? To my knowledge no-one in my lineage has ever attempted to do anything like this...and survived. It's very possible that this might be my last blog post ever. Here's hoping that chocolate and a coffee are all that it takes, cause the company waiting on the other side is totally worth it! I often will turn around if it's at the train tracks. Last week I had a have to go day as well. I packed the portable DVD player for the kids and book for me....the line seemed to move faster. It will shorten once school starts again...don't worry. I am happy to say I survived - and my "marker" of the train tracks is the same...when I have a choice, I think this was the first time I can remember when I didn't have a choice!